Custard is a recipe that is based on heating, blending and slowly cooking a varying amount of egg yolks, milk and sugar. In UK, custard is a sweet sauce that is medium - thick in consistency, which is poured onto your favourite dessert, however in other parts of the world, custard can be very thick. Custard is the most popular dessert sauce in the UK. It is usually offered as an accompaniment to most pies and a number of hot puddings. Most people in the UK would not dream of having a portion of apple, rhubarb or cherry pie without a huge serving of warm custard to go with it. Traditionally, custard is made by using a double boiler, however it can just as easily be prepared in a saucepan, although care must be taken to cook the custard over a very low heat so that it does not curdle. The most important thing to remember when making custard is to beat the egg yolks and sugar together in a separate mixing bowl and then pour the warm milk or cream over the egg yolk mixture into the mixing bowl rather than adding the egg yolks to the saucepan. This is so that the eggs do not cook and scramble. Once the eggs and sugar have been blended into the milk, the mixture can then be returned to the saucepan and the custard is cooked very slowly until it thickens to a creamy consistency. For a very rich custard, which is unfortunately loaded with calories and fat, recipes will call for double cream to be used. On the other hand, for a lower fat version, you can substitute the double cream for single cream, milk or a mixture of the two. Mango Custard is a classic dessert, just perfect for any time dessert and it's my all-time favorite too. As I am a huge mango lover, I store some tinned mango pulp in my pantry for winter to indulge some mango infused desserts. 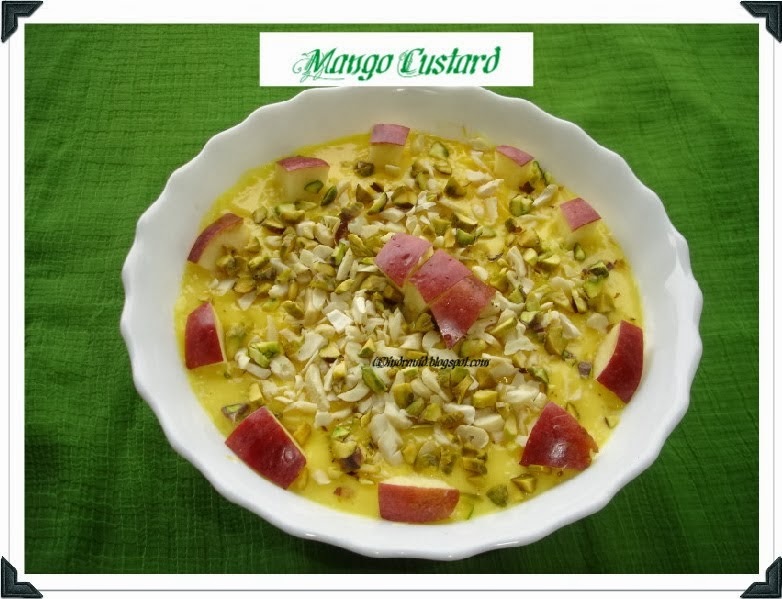 This custard is made with Alphanso mango pulp and basic recipe of making custard on stovetop..just came out perfect. Brown Sugar : about 4 tblsp. Pour the milk into a heavy bottomed saucepan and bring to boil. When it just starts to boil, remove from heat and set it to cool slightly. In a seperate bowl, whisk together egg yolks, sugar and cornflour until smooth and sugar is dissolved without any lumps. Keeping the milk pan off the heat, mix egg mixture into the milk with a wire whisk adding little by little. Add mango pulp and vanilla essence, too same way with wire whisk. There should not be any lump. Take the pan again on stove and cook over a low heat stirring continuously until milk thickens a bit. Remove from heat and set aside to cool in room temperature. Transfer it to a serving bowl. Then chill in the refrigerator for at least 1-2 hours or more. This way Custard will set and thicken little more. Before serving, decorate with fruit pieces, slivered almonds and pistachios.